What is the one specialty you’d think wouldn’t be represented in a military toy line like GI Joe? How about a reporter? This is Scoop, the Joe team’s combat information specialist. Field reporters have been no strangers to American combat ops. However one wouldn’t expect it in a covert outfit like GI Joe. Scoop was part of the late 80’s trend toward adding more varied specialties to the team’s roster. It’s too bad they didn’t take it a step further and get a PR manager for the Joes, just in case they were ever needed to give an interview. Scoop’s most well known portrayal was in the DIC produced 5 part Operation Dragonfire cartoon. In this mini-series, he was recruited to the team after saving Sgt. Slaughter from a burning building while covering a news story. It was later revealed that Scoop was actually a double agent working for Cobra. Since it was an 80’s cartoon, naturally the character couldn’t stay bad and redeemed himself by the end of the series. Another interesting aspect of the figure is that he is based on an actual reporter, Mike Leonard, who appears on NBC’s Today show. As a figure, Scoop definitely looks the part of a combat newsman. Like many of the ’89 series, his accessory count is high. He’s equipped with all the gear needs to get his story transmitted…wherever it needs to go. Maybe he beams it back to Joe headquarters. If that’s the case, I hope Cobra doesn’t employ any satellite TV hackers. He has some very unique sculpting details going on, with a camera and binoculars hanging from his neck, and a very interesting communicator on his left sleeve. 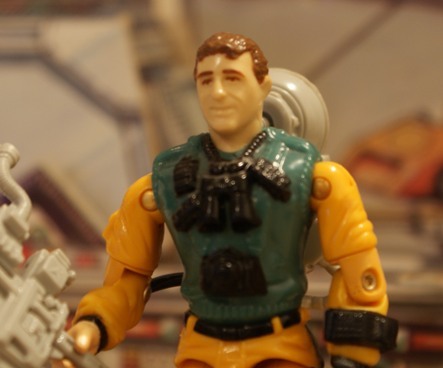 Over the years, Hasbro has reused molds to create other characters, and has also created new designs based on existing characters. Scoop is one of the few Joe characters whose parts have never been reused and who has also never been redesigned. Cool! I’m proud that Hasbro saw fit to include a reporter! I know the real military has reporters, and I hear they don’t take any stuff! A nice tribute figure and certainly a unique character. His colors are similar to those of Lightfoot from the previous year, but I like ’em both anyway. Scoop’s portrayal in the DIC cartoon really helped flesh the character out a bit. I’d rather have Mainframe on my team than this dude. He’s one like Sneak Peek and Iceberg that I’ve never been able to bring myself to get. Let’s not forgot Ernie Pyle, perhaps the most famous war reporter. It seemed like GI Joe in the 80s had a lot of figures and specialties based on specialties around in WWII (thus the ever-frequent flamethrower troopers).